Putting Your Home On A Short-term Rental Site? 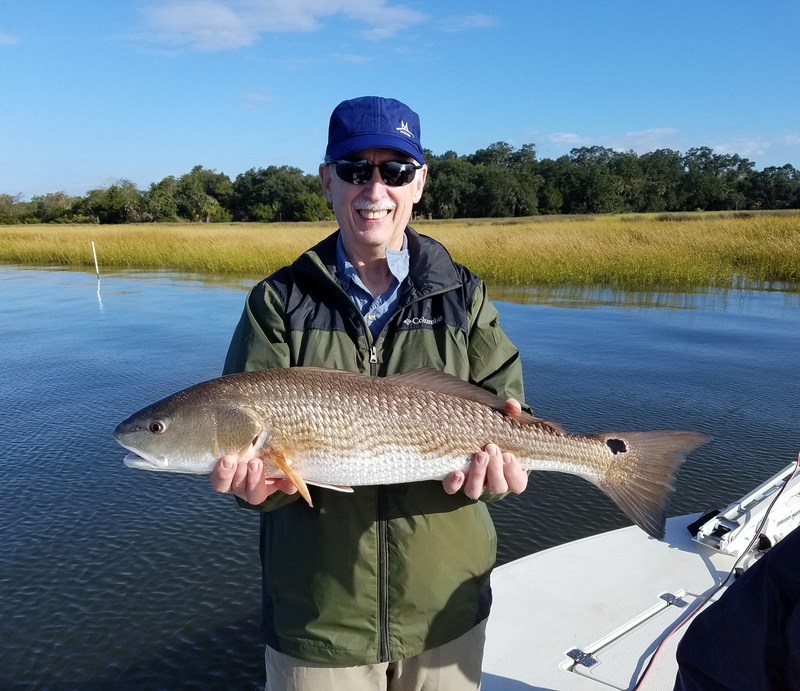 Hank Simmons holds a 9lb redfish caught on the Wando River. Simmons was using a mud minnow as bait with a popping cork. Fishing in October was fantastic and we can expect November to be just as good, if not better! Chilly nights remind redfish and trout that they had better eat now or it will be a long few months ahead. Per usual, artificial lures become very effective as natural bait leaves our waters. Take advantage of sunny days and go catch a bunch of fish. As water temperatures decline, redfish have begun their annual phenomenon of forming large schools. Schools of fifty redfish will become commonplace and they can grow as large as 100-150 in the depths of winter. These fish do become more wary this time of year and artificial lures can spook them on the flats. Instead of casting lures at the schools, we have been setting out as many as three lines with chunks of frozen mullet on #3/0 circle hooks. Eventually the redfish will find your bait and whip your rods over with some ferocious hits. For trout, artificial lures rigged on a jighead are working very well. Trout hang together in pockets and when you catch one there will likely be others in the immediate area. Lures in darker hues of blue and gray are performing the best when paired with a 1/4oz. jighead. Remember to move your lure slowly as the fish are beginning to move slowly as well with the colder waters. Try to bounce the jighead off the bottom and wait until you feel the resistance of a striking fish. Popping corks are still very effective for both redfish and trout. Live shrimp can be used with confidence now that the little bait stealers are gone. I’ll attach a two-foot leader to the cork and a size 1 circle hook on the other end. Cast over oyster beds, along grass banks and at creek mouths and watch for that cork to dive under! It can be so hard to do but when that cork drops, reel the fish tight and let the circle hook do the work. A big hook set can sometimes rip the bait right out of the fish’s mouth. See you on the water! Capt. Geoff Bennett operates Charleston Charter Fishing providing fly fishing and light tackle charters. Clients choose from a full menu of fly rods, artificial and live bait fishing options with charters tailored to their desires. USCG licensed and insured, Capt. Bennett is committed to providing a safe and enjoyable charter to anglers of all skill levels and ages. For more information, call Capt. Bennett at 843.324.3332, visit his website at charlestoncharterfishing. com or email him at captain@ charlestoncharterfishing.com.